2019 Valentine’s day Kids Style – Who says only adults can get dressed up for Valentine’s Day? Like everyone else, babies and toddlers can also get all dolled up for the special day. Babies can look absolutely cute and adorable in Valentine’s Dress. 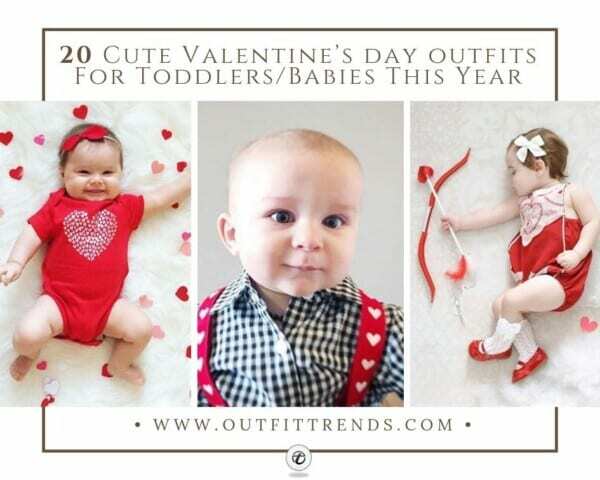 Now you can also dress up your toddler from a simple outfit to a cute baby Valentine’s Day outfit. They also deserve to look good on a special day. You can dress your baby in cute dresses that are worth watching. If you are a new mother and want to celebrate your Valentine’s with your family then you all must be dressed according to the occasion. Plus size moms can also look Valentine’s Day Fashion ideas for plus size women. Carrying your little-loved one in a red outfit will grab everyone’s attention for sure. Look around the shopping malls and you will find many shops offering Valentine’s dresses collection for toddlers. Their collection would consist of beautiful frocks, cute rompers, shirt and tie, swimsuits etc. You can get these at very affordable prices. This occasion comes only once a year, therefore, make it special and make the most out of it. Dress up your toddler and enjoy your day out. Here are some of the best ideas to dress up your baby whether a girl or a boy. See these cute pictures of Toddlers on Valentine’s day functions and choose the best combination for your kid. How To Dress Your Children For Valentine’s Day? You can go for costumes, for example, dress up your little one as a cupid. While red is the ultimate Valentine’s color, you can also go for white and pink. If it is still cold in where you live, dress up your toddler in cute Winter clothes like a red sweater or jacket. Hunt the stores to find the right kind of clothes while simultaneously taking inspiration from this list. You could also go for outfits that can help you twin with your little one. Make sure to add the perfect accessories to their outfits. For example, a cute red bowtie and suspenders for baby boys while headbands or crowns for the little girls. 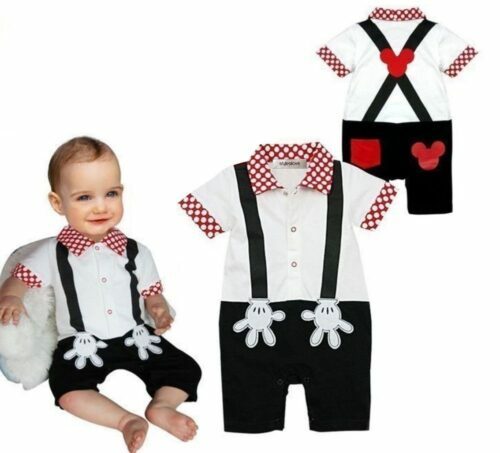 Romper: A cute mickey-mouse romper would look too cute on your baby. Make sure it’s in red. You can also pair it up with another color for a combination. The suspenders with Mickey Mouse detailing look especially cute. Since Mickey Mouse matches Valentine’s theme of red, black and white, it seems like a great option. Since the suspenders have been printed onto the outfit and are not really present, your toddler would not be able to pull on them, making it a convenient way to see the suspenders on them. Shirt and tie: What would be more adorable than this? Your baby wearing a cute shirt with a tie. You can also get a shirt with a tie print on it if you don’t plan on buying the real tie. The crocheted beanie with love written on it is perfect for the occasion and will surely make many go Aww! The beanie also seems like a great heartfelt gift you could hand make for your little one to make the occasion special. Here are 22 Cute Kids Winter Outfits-Beautiful Babies Winter Dressing. Infants and toddlers clothes collection is also available online. If you run out of time and want to order online then you can search for it on the net. Online stores offer some amazing dresses for babies. For baby girls, you can choose frocks. They are very classy and cute. Pink frocks or red fancy dresses would be the most appropriate dress for girls. The statement hairband has been picked carefully to match the frill of the dress which looks beyond perfect. If it is your baby girl’s first Valentine’s, it gives you ever the more reasons to celebrate the occasion. With so many ideas of valentine’s outfits, you can easily select the perfect outfit for your baby girl. Red, white and pink are definitely the colors of the day for kids. Find your baby or toddler an eye-catching outfit that combines these colors to make him or her the star of the night. You can also find clothes for boys that are very trendy. Other than clothes you can also get cute hat accessories for your baby as well. Perfect shoes are also must to complete the look. With all the accessories, dressing, shoes etc. your baby can look like a cupid. Cute animal print outfits and heart outfits are also available in the market. There are many Valentine’s themed outfits. Outfits of Dora the Explorer, Mickey Mouse, Red riding hood, Alice in the wonderland etc can make for the perfect costumes. You will love dressing up your little one for Valentine’s for sure. If your little one is a Winter born and will be marking a milestone around the time of Valentine’s, get a combined theme shoot for your little one storing memories to cherish on for later. You can also find some good ideas from our post on 20 Swag Outfits for Kids for a Perfect Look. If you are against the idea of going for a formal outfit that could pull and tug at your child’s skin and want something sweet and simple, this personalized romper is just what you need. Make your child’s first Valentine’s extra special by going for a romper or shirt that has text specially printed on it. Not only will the outfit look adorable but will also have a special meaning attached to it. This one has been worn over a black and red tights with the hearts print on them. What more could you possibly ask for? This Valentine’s is going to be a fun-filled event. We hope you have decided the right outfit for your baby by now. Do your best and find the most cutest outfit for your toddler’s outfit. A beanie hat is a perfect choice for this day. Check out some of these really cool beanie hats Designs for kids. Make your kid look like a total gentleman by making him wear a bow-tie and tuxedo. A red colored bow-tie, of course, would be the cherry on the cake since it’s valentine’s day after all. The color combinations shown here are ideal for your little man. Since most kids feel uncomfortable in multiple layers of clothing, you could for a printed shirt that gives the look of a vest. You can style it by adding in a bowtie around their collar for the perfect semi-formal look. How adorable is this baby? The outfit is simple and yet catchy because of the funky red coloured shirt. If you are planning on keeping things simple and intimate, this is another great baby boy outfit. Instead of shopping for another outfit, pick something out of the baby’s wardrobe to give him a simple and comfortable attire for the occasion. Here are 12 Cute Minion Outfits for Babies/Toddlers You will Love. While there is much talk over fashion for adults, fashion for kids has seen just as many changes. The latest trend calls for ruffles and frills on their outfits. If you look closely to this one here, there are frills on both the top and the skirt. The white and red combination perfectly matches that of Valentine’s. The little girl has been adorned with layers of Pearls for her photoshoot, making her look glamorous and trendy. If you’re having a valentine’s day party at home then a bow-tie is a must have. This one in polka dots seems to be added just the right amount of color to the monochrome style. The bowtie also looks great with the patterned suspenders. These two pieces of accessories can easily transform a basic outfit to Valentine’s theme outfit, saving you the cost of buying a separate outfit for the theme. Cute hat with any outfit could be a unique style. This oversized hat and tie combination looks super cute on the little guy. It will definitely be a show stealers and will make for a funny yet adorable outfit. Target has a huge collection of cute shirts or baby’s first Valentine’s day so do check it out. Headbands always make the cutest accessory for baby girls so don’t forget to make a cute heart shaped headband a part of her look for the day. Don’t miss out these 23 Cool Dresses for Baby’s Casual Style. Once again, if you want something that’s simple yet elegant then camel coats would be the best choice. The parents can also wear matching camel coats to create the most awesome family outfits. Add a touch of red by going for red sneakers or accessories. Tutu skirts are known to be a baby girl’s best friend. They look super cute and work well with simple rompers and shirts. If you have found an adorable romper to dress your little one in, you could consider pairing it with a voluminous skirt like this one. The oversized bow headband can be great to cover up the bald head. Also, have a look at these 27 Cutest Clothes For New Born Baby Girl. If you have two or more kids then make sure that you color coordinate their outfits. The little girl has been dressed in a pink frock while the boy has been dressed in a collared red shirt. You could also make it fun by dressing up your little ones in the same color and design. Don’t forget to capture all your hard work by taking some awesome pictures. A valentine’s day photo shoot is always a must and you can make it even better by creating some lovely props and backdrops. And amidst all the preparations, don’t forget to choose a lovely outfit for yourself, you can get some amazing inspiration from these 100 Cutest Matching Mother Daughter Outfits on the Internet So Far. Here is a casual yet trendy look for the bigger girl if you are planning a fun shoot. Dressing up in the theme of red for a family shoot can end up like a fun way to make memories. This plaid dress paired with a red cardigan looks super attractive and matches the theme. If the shoot is a daytime one, give your little one some Raybans to make her look super cool. The two pieces of accessories: the belt and the polka dots headband are making this look chic and ultra modern. Some more cute ideas to show off your photography skills, along with your cute angels of course! If you are not too fond of the colour red and need something different for your little girl, check out this white romper. Why not go for lighter tones like White and Baby Pink instead of red? The matching tights in crown print and bow look super adorable with the white romper. Add in a bow headband and the look will be complete. Make your Valentine’s dinner extra special with a look that holds special meaning for your family with an outfit like this. While it seems like all the funky and adorable outfits have been reserved for the girls, we bring you a great unisex option that you could pick for your son or daughter. This heart stealer themed top in red is the perfect colour for Valentines. Pair it with a basic denim pant with suspenders or a dungaree for a super cute look. This is another simple option, sure to win hearts. Why go for a mainstream look when you can get something simpler and meaningful. If you are not planning on hosting an extravagant affair and want to keep things intimate and minimalistic, this dress seems like a great option for your little baby girl. Valentines is the season of love and what better way to symbolize it than with hearts. You can easily find a printed heart dress in stores and online. Pair it with accessories like this bow headband in red colour. The oversize bow is definitely adding the right kind of details to the look, sure to get all the spotlight at any family dinner.